One thing that I would advise here is that you keep in your mind what sort of a page you exactly want and how would the combinations for layout and headers work with the content of your site. Who wants to sell bananas and apples in a meat shop? Piece of cake, any name that you think reflects your idea or sums up your business goes here. By default your address would be in the format: http://www.YOURADDRESS.moogo.com, which is because your domain is hosted at Moogo. However you have the option to pay $14.99 and get your domain registered and rid yourself of the Moogo.com extension (i.e. mybusinesssite.com). Keep in mind that your selected name is very unique and is not already registered both at Moogo or elsewhere. The last step is of course registering your site and heading over to see the finished product (mine is here). The features that Moogo offers is why I think the application is worth at least a test. 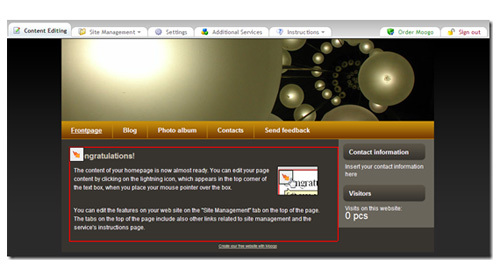 You can edit content on your website and for that it offers a really sleek dashboard with numerous options. Those include features like adding additional pages to your website, a blog, photo album and even polls. In my opinion it is a less technical form of the WordPress dashboard and is really very helpful. There are site statistics as well, something which everyone should keep an eye on. The stats let you monitor the number of page views, from where your traffic is coming from (referrals, etc). You can add a counter to your website and boast about the number of visitors you get and even learn what browser is most commonly used by each one of them. And nothing requires you to be technical in any aspect! I have seen many website creation tool and a countless portals that create a free website in clicks. But to be honest, Moogo is really worth at least a trial as the people at Moogo have paid attention to what exactly needs to be provided for the users. I guess the winning aspect is that they give consumers the power to take charge of the content they put online with all those tools and services. The Moogo website builder works while you are on-the-go as well. The Web portal comes loaded with a mobile device identification tool that lets Moogo adjust your site as per the capabilities of your handset so you have the best experience. And with the latest option to edit content on mobile would definitely make life smooth as you can edit without needing a laptop. I admire the fact that the team takes user satisfaction and customer needs so seriously. They offer features like the Moogo Custom Mobile site which lets you decide what content of your is displayed on mobile phones with more customizations on the way. Then they have the ever engaging Moogo Member program, the idea of which is to communicate with users and constantly get their feedback to introduce better and more useful features. More like a forum, which would bring users, developers and the people that make Moogo at one place. Sardar Mohkim Khan writes for Startup Meme, an unofficial guide on Facebook and works as a Researcher for Dawn News Television in Pakistan. You can follow him on Twitter (@smohkim), Facebook and LinkedIn .